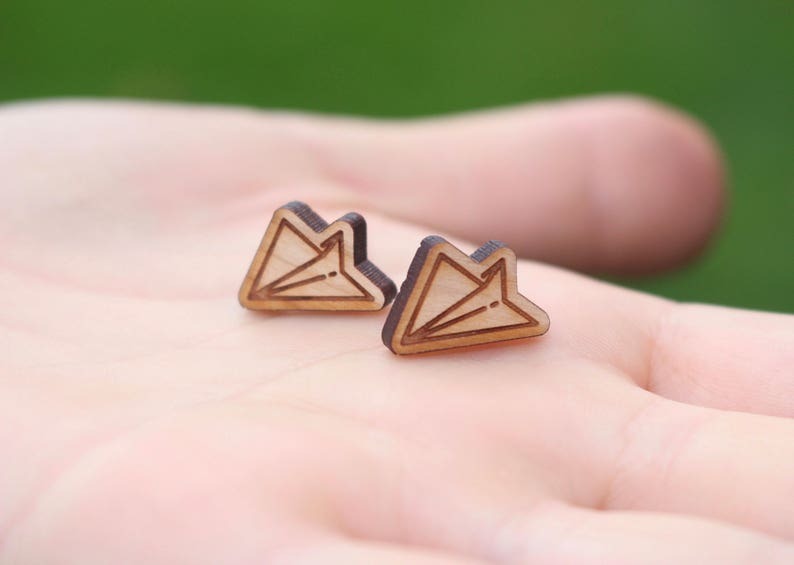 You'll look super FLY in these paper airplane studs! These fly boys are 14mm by 12mm and are mounted on pure titanium posts, the pad is surgical stainless steel and the ear nut is plastic, so everything is hypo allergenic! We are passionate about hypo allergenic because our owner has ears just as sensitive as you! There is nothing worse than to find a CUTE pair of earrings that make your ears itch and burn! We hope these give you NO issues! Please chose the style that you want from the drop down, but even if the pair you want is not available, all the sets are unique and magnificent, feel free to choose another! Arrived super fast (again) and they're fun to wear right-side up or upside-down.